-Squid appears grouped on reels 2 and 4 and substitutes for all other symbols except scattered Captains. -The prize is doubled when one or more Squid substitute in a winning combination. -Captain (Scatter): Scatter wins are multiplied by total bet. -All symbols pay Left to Right except scattered Captains, which pay Any. -Scatter win are multiplied by total bet. -7 free games are awarded when 3 or more scattered Captains appear anywhere. -All prizes are tripled during free games. 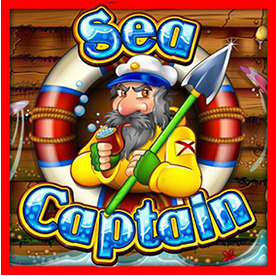 -One extra free game in Sea Captain is awarded whenever a Captain appears during free games. -The free game feature of Sea Captain cannot be retriggered.